TBC1D24 – what’s new in 2016? The story of TBC1D24. As with many epilepsy genes, the TBC1D24 story increases in complexity over time. Initially described to be associated with autosomal recessive familial infantile myoclonic epilepsy by Falace and colleagues and with autosomal recessive focal epilepsy by Corbett and colleagues in 2010, pathogenic variants in TBC1D24 have since been identified as a major cause of DOORS syndrome and have also been identified in individuals with familial malignant migrating partial seizures of infancy, progressive myoclonus epilepsy, early-onset epileptic encephalopathy, and autosomal dominant and autosomal recessive non-syndromic hearing loss. However, little is known about a potential genotype-phenotype correlation of TBC1D24-related disorders, as well as the underlying mechanism. Keep reading to learn more about recent discoveries related to TBC1D24. 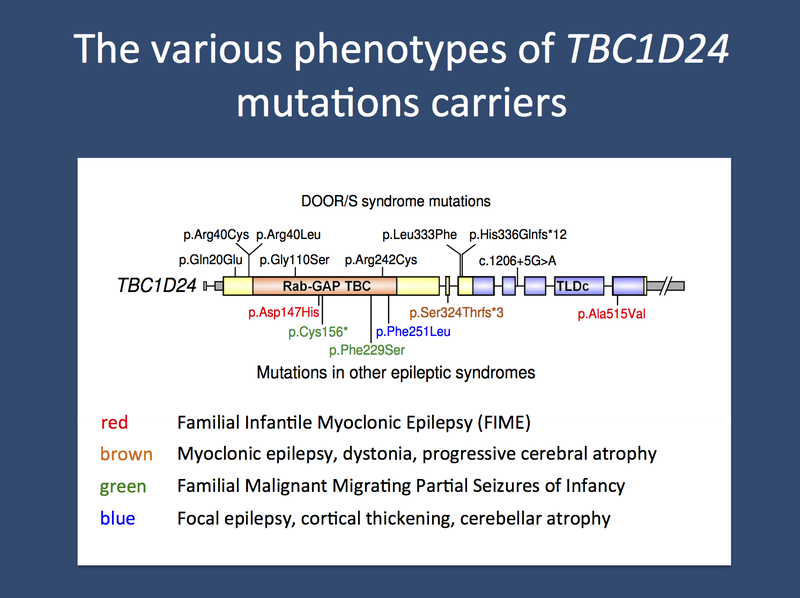 The various recessive and compound heterozygous epilepsy phenotypes due to mutations in TBC1D24. What we are learning about TBC1D24. Our understanding of TBC1D24-related epilepsy continues to expand. Here are some of the highlights of what we have learned in recent months. The continuing expansion of the TBC1D24 phenotype. Doummar and colleagues recently described a boy with TBC1D24-related epilepsy who helps illustrate the complexity of the TBC1D24 phenotype. The boy presented with multifocal attacks of myoclonus alternately affecting the hands, eyelids, limbs and sometimes the trunk, starting in infancy and occurring monthly. He did not present with other seizure types until about 8 years of age. Between 2 and 5 years, he developed episodic gait ataxia, mild cerebellar syndrome and intellectual disability. Brain MRI showed progressive hemispheric cerebellar atrophy with hypersignal of the cerebellar cortex and white matter. More TBC1D24 updates. Visit our TBC1D24 gene page to learn more about other updates on TBC1D24. Take a look at the additional topics that we have added with our revised gene page content, including sections on the clinical perspective, animal models, references, and research. This entry was posted in 2016, Epilepsiome, TBC1D24, Updates. Bookmark the permalink.